FRAMINGHAM, Massachusetts Staples' (SPLS) fiscal fourth-quarter net income dropped 72 percent, dragged down by charges related to store closings and other matters. Its adjusted results topped Wall Street's view, but its forecast for this year was below analysts' estimates. The office products company also announced Wednesday that it is increasing its quarterly dividend by 9 percent. Staples Inc. has launched a strategic plan that includes investing more in its online and mobile efforts and expanding the product assortment that it offers to business customers. For the period ended Feb. 2, the chain earned $78.1 million, or 12 cents per share. That's down from $283.6 million, or 41 cents per share, a year earlier. Excluding charges tied to stores closings and other items, earnings from continuing operations came to 46 cents per share. Analysts expected 45 cents per share, according to a FactSet survey. Revenue rose 3 percent to $6.57 billion from $6.37 billion, helped by an extra week in the period. Taking out the sales during the extra week, revenue fell 4 percent from a year ago. Wall Street forecast $6.71 billion in revenue. International sales dropped 4 percent because of softness in Australia and Europe. Staples lost $210.7 million, or 31 cents per share, for the full year. In the prior year it earned $984.7 million, or $1.40 per share. Annual revenue edged down 1 percent to $24.38 billion from $24.66 billion. The U.S.-based company anticipates 2013 earnings between $1.30 and $1.35 per share. Revenue is expected to rise by a low single-digit percentage rate compared with 2012's consolidated sales of $23.92 billion. Analysts expect $1.44 per share on $24.33 billion in revenue. 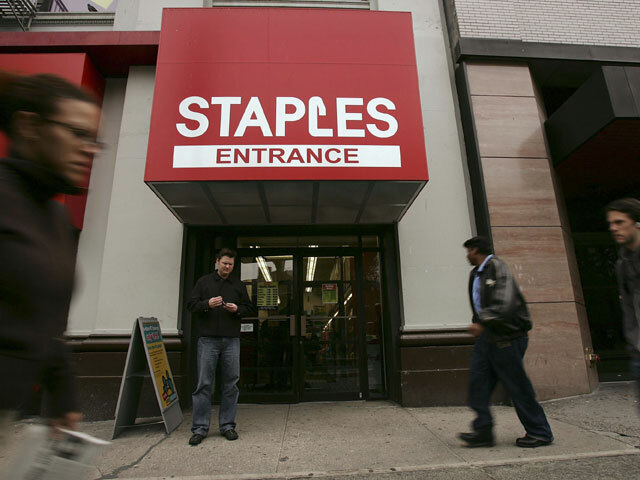 Staples raised its quarterly dividend to 12 cents per share from 11 cents per share. The dividend will be paid on April 18 to shareholders of record on March 29. Its shares finished at $13.29 on Tuesday.